In today’s age of BOGO (Buy One Get One) sales, online ordering, discount stores (Home Goods, TJ Maxx, Marshall’s), and bulk purchasing stores (BJ’s, Costco), over-buying can sneak up on you all too easily. Before you know it, you have a house filled with things that seemed like a good deal at the time, but that you never used. These things can sit for years collecting dust, taking up space, and creating chaos in your home. Here’s how to avoid becoming a pack rat. Question It – While you’re waiting on the checkout line, ask yourself: ‘Do I really need these items or am I just excited to purchase them because it is a great sale?’ Using the technique of NOT buying and going away before you purchase is a great way to separate yourself from the ‘high’ of the sale verses the need for the item. If you get home and really do NEED that item, at least you know you have a real need and not just a desire for the sale. Know What You Already Have – I have worked with many clients who have an abundance of items like peanut butter, tuna, pasta, or you name it living in their pantry. The reason they have so many of one item is that they have no idea they already own multiples of any one item in their pantry! 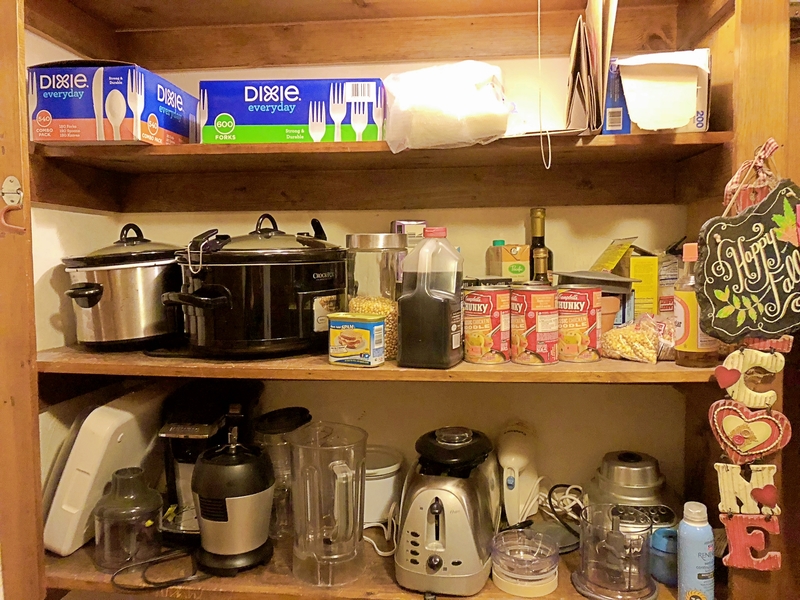 Their pantry is disorganized, and they don’t keep a list of what they are running short. As a result, they keep buying items they use a lot and keep shoving them on their shelves. Get Organized – Organize your pantry and start keeping a shopping list. By doing so you will save money by not over buying any one particular item. Added bonus: you will use up your existing inventory of an item before it expires. This will also save you money. Set Limits – Use a drawer, shelf, or container to limit how much of any category or item you stock will help you to not over buy. For example, In the case of clothes, if you have one drawer that holds your turtlenecks and you absolutely have to have the sage one you just saw on sale, then you have to use the ‘One In, One Out’ rule. In order to stay within your drawer space allowed for the new turtleneck, a turtleneck you no longer wear must go. Setting aside specific shelf space for excess toilet paper, paper towels and such items, will act as a limiter to how much more you can buy. Keep A Shopping List – Now that you have your pantry organized, and specific space set up for your items, set up a shopping list. This will prevent further overbuying. You can do this the old-fashioned way, by putting a notepad and a pen on your refrigerator. Or you can use Alexa or Siri. Both applications have list apps. As you run out of an item, write it down on your shopping list or tell Alexa/Siri to add it to your list. When you go to the store, only buy what is on your list and mark each item off as you purchase it. When you are out of items on your shopping list, go directly to checkout. Do not pass go, do not collect additional items. Avoid The ‘Grab Me’s’– Every checkout aisle, no matter how big or small, has small items such as coffee mugs, magazines, chewing gum, chocolate, reusable shopping bags, and gift cards set up around them. Some stores even have long checkout aisles with numerous items stocked on them that you have to pass through to get to the register. Focus only on what is in your cart at the register. Add any “Grab Me’s” you see to your shopping list for the next trip. This will allow you to think about these purchases, and decide if they are actually needed, before you buy them. There Will Always Be Another Sale – I just got a 20% off coupon for Sephora in my mailbox. This comes right on the heels of the 20% off coupon I received from Ulta that just expired. It also coincides with the 10% off beauty products coupon from Macy’s included in their recent flyer. While coupons can be useful, and may present a great way to stock up on something you use frequently, don’t buy something you already have plenty of just because you have a coupon. Remember: there will always be another coupon available when you actually need an item. You don’t want your house being taken over by any excess purchase. Your real estate costs too much for it to be cost effective to give up living space for over purchasing. What do you use or do to help you from becoming a pack rat? ‹ How Do You Apply for a New Job?